The ProForm 10.0 CE elliptical trainer is an exercise machine with an adjustable stride system. Aside from its eight timed workout and weight-loss programs, it comes with 12 digital resistance levels. This elliptical trainer has an Intermix Acoustic system and iFit workout technology integrated. There is also an iPod audio system and a cooling fan that will help people make their training more pleasurable. It also has a Space Saver design that enables this treadmill’s base and pedals to fold in order to minimize the space that it takes up when not in use. 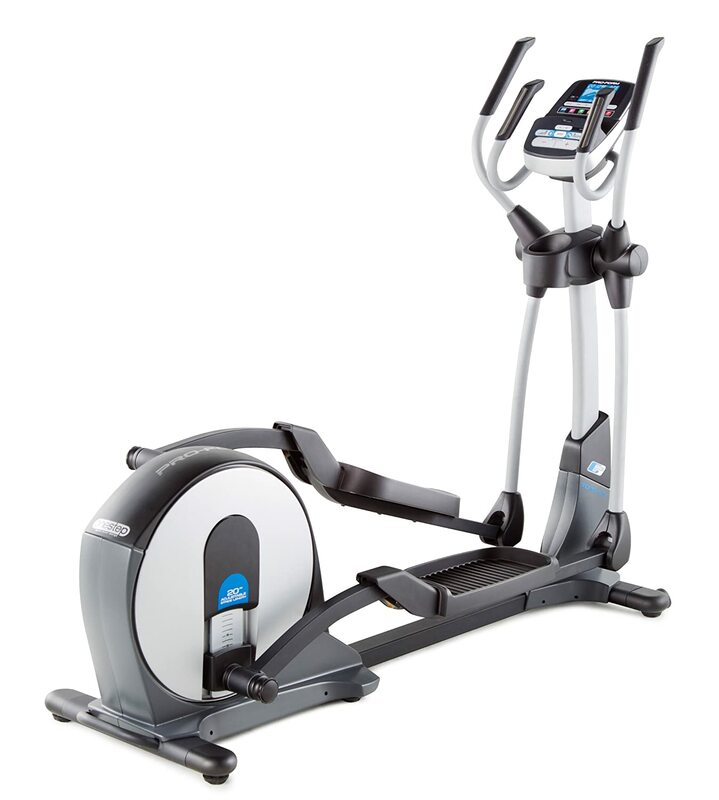 In a nutshell, the ProForm 10.0 CE elliptical is all about resistance and adjustable stride with a price under $700. This elliptical made it to our top picks for the Best Elliptical Machines of the year. There are a number of things that make people like the ProForm 10.0 CE Elliptical. One of its best features is the 16” to 20” adjustable stride. Because this machine comes with these stride lengths, a lot of owners like the fact that this machine is suitable when multiple people with different heights use it. Aside from that, they can obtain better workout results because they can target certain muscle areas by adjusting strides when they are using this machine. Another feature that people like about this machine is its built-in sound system that comes with MP3 player support. With this, they can connect their MP3 player to make their workout session more enjoyable. This is good for people who enjoy working out while listening to their favorite music. Aside from that, it has 18 workout programs to choose from. This is much better than other exercise machines in the same price range that only have eight to eleven programs at the most. People can also experiment with the many settings available. Users can also add variety to their workout experience to help them achieve more effective fitness results. People also like the machine’s SpaceSaver folding feature. It means that they do not need much room in to store the ProForm 10.0 CE. Another feature that people like about this machine is its traction-controlled and oversized pedals. This enables them to place their feet in the most comfortable position while they are working out. People also like the console on the ProForm 10.0 CE as it is well laid out and very neat. It is not full of controls and buttons that people what to do with. Instead, it just has the relevant feature and setting buttons in clear visible view. This allows users to adjust them as they need during and before their workout. The machine also has a five inch backlit display in the console that is easy to read and very clear. Users can easily see the relevant information that they need to know throughout their workout session. The treadmill also has soft grip handlebars that add balance and comfort. Users like the fact that they can adjust the resistance and incline settings while holding onto the movable handlebars. It means that they do not have to take their hands off the handlebars to adjust their workout. People also like the locking pin safety feature. This enables them to have peace of mind knowing that the pedals are secured in place and will not hurt children if they try to tinker with it. People also like the fan in this exercise machine as they can quickly and easily adjust the settings. Some users complain that this machine has some noise issues when working out. Even on the lowest settings, they claim that the noise can be pretty intense. Aside from that, they also experience a knocking sound when they adjust the levels. Some people also do not like the fact that it wobbles and shakes even when it is perfectly balanced. A number of people also complain that the machine is very hard to assemble. The written directions are not clear. Although this machine is iFit compatible, it does not come free. Users have to shell out $100. Even though it is an optional extra, it can be frustrating to see there. People also complain that the arms and frame are not perfectly aligned. Aside from that, this exercise machine is not compatible with industry-standard Polar heart-rate straps. The built-in sensors are only found on the fixed handles that some users claim are inconvenient. People also wish that this machine would have a built-in BMI where they can enter their weight, height and age. Another drawback to this machine is its very light flywheel. It does not provide powerful or very smooth resistance. In addition, the trainer stride should be adjusted manually. This means people will not get the most from workouts found on Google maps. With other trainers, the elliptical will change its incline to match the real terrain. Although there are features that ProForm needs to address, this is still one of the best mid range elliptical trainers designed for home use. It runs very well and has a lot of features that will make a workout intense and enjoyable. This machine is one of the best workout tools out there for a person who does not have enough time to go into the gym. The SpaceSaving feature is particularly useful for people with limited space in their rooms who still want to own a high-performance and heavy-duty trainer. It also has a lifetime frame warranty and a one-year warranty on labor and parts. Overall, it is a solid model that has a number of innovative features and provides great value for the money at its current selling price.